Tōju Nakae (April 21, 1608 – October 11, 1648) was a Japanese Confucian philosopher known as "the sage of Ōmi." Nakae was a feudal retainer who lived during the Tokugawa shogunate who stressed the values of filial piety, compassion, respect, sincerity, and helped shape the moral and ethical code of Japanese culture. His lessons and stories have been found in textbooks to provide morality in the Japanese education system. In modern Japan, they are again being recognized as a means of countering the egoism and materialism of modern society, and of teaching spiritual values in a competitive world. 4 Toju’s "Five Behaviors of Morality"
Toju understood the virtue of filial piety as the supreme virtue among all virtues, and furthermore conceived it as the supreme metaphysical principle of the cosmos. For Toju, the supreme being is not a non-personal natural principle, but a being with personality. He called it "Jyokotei" ("Supreme Emperor"), and the virtue of filial piety to this supreme being is equally inscribed in the heart of every individual. Toju's idea of equality was unique among Confucianists and in feudal society of Edo period in Japan. Nakae Toju was born Nakae Yoemon, a farmer’s son, in the Omi province of central Japan. At nine years old he was adopted by his grandfather, a retainer of Lord Kato of Yonago domain (now Tottori prefecture) on the coast of the Sea of Japan, and a year later he moved with his grandfather to a new assignment at Ozu in the Iyo province of Shikoku where he studied calligraphy and Chinese poetry with a monk. When he was fourteen, a chief retainer and four or five followers visited Toju’s grandfather. Toju eavesdropped on their conversation all night, expecting a person of such high position to speak words of wisdom and discernment, but all he heard was idle chit-chat. This disappointment led Toju to study Confucianism and Neo-Confucianism. After his grandfather’s death he inherited his grandfather’s stipend as a retainer. When he was 17, a Zen monk from Kyoto inspired him to study The Analects of Confucius. He became a county magistrate at age 19, and three years later wrote Daigaku Keimo. At age 25, as a dutiful son he returned to his mother in Omi province and tried to persuade her to come and live with him, but she refused. In 1634 Toju asked to resign from his official position, citing filial piety to his mother and poor health. The Lord rejected his resignation, and he decided to leave without permission. In those days, if a samurai (warrior) left his post without the permission of his lord, he would be pursued and killed on the spot. After concealing himself for some time, Toju returned to Omi province and opened a private school. In 1637 he married Hisa, the daughter of a retainer of the Ise-Kameyama domain. He began to gather a group of students, who called him Toju (wisteria tree) because of the Japanese wisteria trees in Toju’s garden. His private school was also called Toju Shoin. In 1641 Kumazawa Banzan, who later became an eminent scholar, heard “The Story of the Honest Packhorse Driver” and visited Nakae Toju to inquire if he could be his disciple. Toju responded that he was not great enough to be his mentor. Banzan returned home, but again he visited Toju and asked to be a disciple. When Toju rejected him a second time, Banzan stayed in front of Toju’s house for two nights until Toju’s mother, unable to look on in silence any longer, interceded. Finally Kumazawa Banzan was allowed to enter Toju Shoin. He studied under Nakae Toju only eight months, but Toju and Kumazawa Banzan established such a deep relationship that, after Toju’s death, Banzan returned to visit his grave every year for forty years. Nakae originally followed the teachings of the Chinese Neo-Confucian philosopher Zhu Xi, but eventually became more influenced by Wang Yang-ming (1472–1529), who argued for the primacy of human intuition, or conscience, over intellect. He taught that moral improvement arises from conscience-based action. Nakae added a more religious aspect to Wang's "School of Intuition of Mind," calling the human conscience the "divine light of heaven." Nakae's works provided his followers (such as Kumazawa Banzan) with "the moral foundation for political action." Toju’s developed his thought by integrating the ideas of Daoism, Buddhism and Shinto based upon his readings of Neo-Confucianism and Wang Yang-ming. Toju emphasized the value of “filial piety” above all virtues in Confucian ethics and extended the virtue of filial piety from the sphere of human relationships to the metaphysical realm. Furthermore, he understood it as the primary principle of the cosmos, thereby establishing a virtue based cosmology. Toju conceived the supreme being not as non-personal metaphysical principle but as a being having personality and called it Jyokotei (“Supreme Emperor”). According to Toju, all beings in the cosmos are organized around the central axial principle of filial piety. Toju stressed that the heart of filial piety to the “Supreme Emperor” is equally present in each human being regardless of one’s awareness of it, and cultivating this implicit quality creates a morally right society. 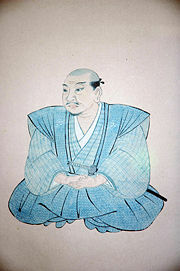 His idea that all individuals are fundamentally equal under the “Supreme Emperor” is unique among Confucianists and feudal societies of the Edo period in Japan. Toju also tied moral principles with luck, or spiritual fortune. While actions made according to these moral principles lead to good spiritual fortune, actions made against these principles entail misfortune. For Toju, like Immanuel Kant, moral goodness is presupposed for genuine happiness. Toju taught that the highest virtue was filial piety (kō). He gave up his official post in 1634 to return to his home in Takashima, Ōmi prefecture, to care for his aging mother. He distinguished, however, between sho-kō and dai-kō, lesser and greater filial piety. Sho-kō involves the normal care owed by children to their parents; dai-kō involves the notion that our human parents are themselves the children of the divine parents—thus, if one's parents are wrong, then one should encourage them to return to virtue. “The Story of the Honest Packhorse Driver”: A packhorse driver named Matazaemon lived in village adjoining Nakae Toju’s village of Ogawa. The work of the packhorse driver was to carry passengers and luggage on the back of his horse. One night, after transporting an express messenger of Kaga province to the next post station, the packhorse driver found that his customer had left a large amount of money behind. Though it was midnight, the packhorse driver immediately returned to the post station and gave the money back to the express messenger. The express messenger said, with tears, that if he had lost the money he would have been executed. The express messenger wanted to give Matazaemon a generous reward, but the packhorse driver never accepted it, explaining that he was only keeping the teaching of Yoemon (Nakae Toju) of Ogawa village. The express messenger continued to insist until the packhorse driver finally accepted only a few cents, the price of transporting a single passenger for a few miles. After leaving his position as a Samurai, Toju came back to his hometown, the village of Ogawa. To support his mother, he started a business selling sake (liquor). His teaching occupied him so he asked his customers to serve themselves and calculate what they owed. When Toju tallied his accounts at the end of the month, they were always exact. An example of Toju's impact in his village is that when someone lost something, it would surely be found and returned to its owner. The owner of a noodle restaurant brought a clean, new board to Nakae Toju’s house and asked him to write some calligraphy on it for the front of his business. After one week he returned, but Nakae Toju told him the sign was not ready. Ten days later, the restaurant owner came back and found a beautiful sign, which he hung on the front of his shop. One day a daimyo and his entourage stopped to rest in front of the restaurant. One of the lord’s servants entered the restaurant to buy noodles and was so impressed by the calligraphy that he bought the sign for a large sum of money and presented it to his lord. Excited, the restaurant owner went back to Nakae Toju to ask him to paint another sign. Nakae Toju went into the back of his house and came back with a large stack of paper. He spread the papers out and showed the owner that he had spent more than two weeks practicing the calligraphy so that when he painted the sign, it would be perfect. The restaurant owner was humbled and ashamed, because he realized the depth of Nakae Toju’s sincerity and effort in making such a simple thing as a sign for a restaurant. When he returned to Omi, Nakae Toju opened a school and became a doctor for the rural town. He taught his students not only about Confucianism, but also about medicine. His friend had an adopted son, Ono Ryosa, who suffered a mental handicap, and was planning to teach him some kind of manual trade. The boy, however, came to Nakae Toju’s school and insisted that he wanted to become a doctor. Nakae Toju spent six hours teaching Ono a single page of a textbook, but after dinner the boy had already forgotten everything. Nakae Toju was exhausted, but Ono was determined to be a doctor. Finally, Nakae Toju realized that the boy could not understand Chinese characters, so he wrote a special, simplified textbook just for him. Ono Ryosa studied this textbook diligently and eventually became a doctor. One hundred years after Toju’s death, a passing Samurai asked a village farmer to guide him to the grave of Toju. The farmer returned home to change into his best clothes. The Samurai felt self-satisfied because he thought the farmer was dressing up to pay homage to him. When they arrived at Toju’s grave, the farmer sat on his heels with his back straight and lowered his head in front of the tomb. The samurai realized that even hundred years after his death, Toju’s legacy was still alive. Toju’s "Five Behaviors of Morality"
Appearance: Approach people with love and a respectful heart, reflected by a gentle and peaceful facial expression. Words: Speak in a way that can be comfortably accepted by people. Looks: Look at people and things with a loving and respectful look on one’s face. Listen: Listen to other peoples’ point of view. Compassion: Understand people with love and a respectful heart, and be considerate of the feelings of others. This page was last modified on 10 December 2015, at 23:39.